MULTICULTURAL CHURCHES & Catholic researchers of multicultural parishes share the best ways to create growing multicultural communities. by Peter Feuerherd, NC Reporter, 6/14/18. Brett Hoover and Hosffman Ospino, two experts on multicultural ministry from both coasts, agree: The church needs to get this right as it moves into a future with a declining base of white Catholics. For Hoover and Ospino, there are elements to watch out for as parishes attempt to incorporate different ethnic groups. Ospino, a native of Colombia and professor of religious studies at Boston College, conceded that not every pastor or parish leader can be bilingual. But anyone with cultural sensitivity can allow leadership to percolate from ethnic groups. Being hospitable doesn’t need translation. Hoover once met a parish usher, “a person of great heart,” who knew no Spanish, but was able to communicate a warm welcome to everyone who entered the church via gestures and smiles. Ospino, author of a forthcoming book from Fordham University Press titled Cultural Diversity and Paradigm Shifts in Latino Congregations, suggests that people from all groups in a parish occasionally come together to share faith experiences. Different views, for example, on how Catholics of all nationalities approach the Blessed Mother is a good faith icebreaker. Be prepared for culture clash. “For most of us, our parish is the Catholic world,” said Hoover. Newcomers from different cultures will, by definition, see Catholic culture and practice in a different light. “It’s the culture clashes that irritate people,” he said. In his extensive studies of Catholic bicultural parishes, Hoover frequently finds himself in a bridge role. Simple items, such as the use of collection envelopes, carry cultural baggage. Mexicans are used to giving to the church, but not so much in weekly Sunday Mass settings. Tradition there focuses on particular celebrations. Demographic trends are creating grief in the wider culture. Immigrants are unsettled by their experience. Those who have been in the U.S. for a while can resent the loss of how things “used to be.” Multicultural parishes can be “crucibles of grief” for all kinds of cultural anxieties, said Hoover, an anxiety that is being played out in American politics and social life. Parish leaders need to be aware that many white Catholics, perhaps the majority, voted for President Donald Trump. For Latinos, the president’s immigration policies are often viewed as a personal threat. 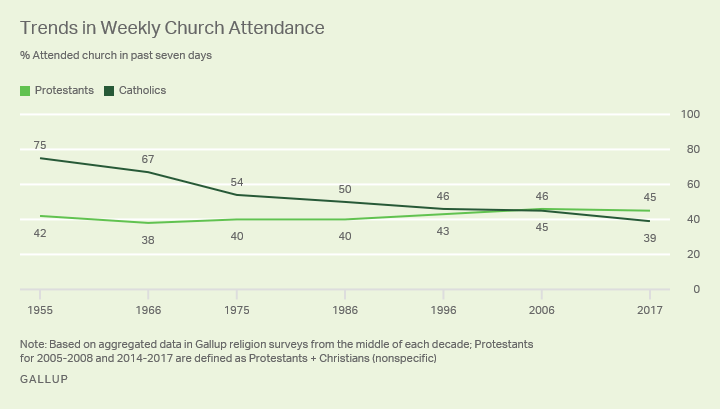 CHURCH ATTENDANCE & Gallup research: Percentage of Americans identifying as Protestant has declined sharply & those professing no religious identity, up to 20% from as little as 2% just over 60 years ago. WASHINGTON, D.C. — Weekly church attendance has declined among U.S. Catholics in the past decade, while it has remained steady among Protestants. … Currently, the rate of weekly church attendance among Protestants and Catholics is similar at most age levels. One exception is among those aged 21 to 29, with Protestants (36%) more likely than Catholics (25%) to say they have attended in the past seven days. …Although weekly attendance among Protestants has been stable, the proportion of adults identifying as Protestants has shrunk considerably over the past half-century. And that trend will continue as older Americans are replaced by a far less Protestant-identifying younger generation. DENOMINATIONS & Largest 25 Denominations/Communions from the 2012 Yearbook of American and Canadian Churches. The Hartford Institute for Church Research, retrieved from http://hirr.hartsem.edu/research/fastfacts/fast_facts.html#sizecong, 11/9/16. By Joanna Piacenza, Robert P. Jones, American Values Atlas, 8/30/15. Earlier this year, we took a look at the top three religious traditions that dominate the U.S. Now, using the metro areas variable of the American Values Atlas (AVA), we turn to our country’s cities, where we find a similar trend: Catholics and the religiously unaffiliated dominate. * Catholicism is the top religious group—or tied for the top religious group—in 15 of the major metro areas. * The religiously unaffiliated is the top “religious” group—or tied for the top religious group—in 10 of the major metro areas. * And don’t forget about white evangelical Protestants, who take the top prize in six of the major metro areas. * Atlanta is the only metro area that doesn’t have Catholics, the religiously unaffiliated, or white evangelical Protestants in the number one slot; that prize goes to black Protestants. * Urban areas attract the unaffiliated; the religiously unaffiliated are among the top three religious groups in every metro area polled. * Catholics also love cities; Catholicism is among the top three religious groups for nearly every metro area—only Nashville, Charlotte, Indianapolis, Kansas City, and Atlanta don’t have Catholics among the top three. * In every metro area where Catholicism takes number one, religiously unaffiliated takes number two. * All but nine metro areas have Catholicism and the religiously unaffiliated in the top two. * Nashville has the largest percentage of one singular religious group: nearly four in ten (38 percent) residents identify as white evangelical Protestant. * Portland has the largest percentage of one singular “religious” group: 42 percent identify as religiously unaffiliated. Explore more of the AVA here. Although most U.S. Hispanics continue to belong to the Roman Catholic Church, the Catholic share of the Hispanic population is declining, according to a national survey of more than 5,000 Hispanics. Meanwhile, rising numbers of Hispanics say they are Protestant or are unaffiliated with any religion. Indeed, 24% of Hispanic adults are now former Catholics, with changes in religious affiliation occurring primarily among Latinos ages 18 to 49. Among Latino immigrants who have switched religions, about half did so before coming to the U.S. The survey also finds that in every major religious group, more Latinos favor the Democratic Party than the Republican Party, though there are some differences in party affiliation across groups.